To create a memorable culinary experience one needs quality ingredients, preparation and the talent to put it all together. Well, the same can be said about building the kitchen itself. Luckily for you Häfele America Co., one of America’s leading suppliers of kitchen organization and furniture hardware components, has elevated it’s selection of Michelin star level products to exceed the needs of today’s kitchen environments. The recipe can be found in booth #4422 of the AWFS Fair 2017. The latest addition to Häfele’s stable of kitchen organization is the all-new Fineline™ Kitchen Accessories. This Häfele patent-pending range of products combines some of the market’s most popular pantry and blind corner pull-out units with warmly attractive woods and fine metals. The versatile functionality of Fineline Kitchen Accessories is available in your choice of birch or walnut boxes which easily pair with any style of kitchen―be it traditional, transitional or contemporary. Available metal finishes include stainless steel, silver and champagne to complete the look. Little gets done in the kitchen without having proper storage. Häfele’s Fineline Move does this with style and modularity as a system of trays, dividers, boxes, baskets and holders to support wider and deeper drawer sizes offered in birch or walnut finishes. Coupled with Non-Slip Mats, the duo becomes an organizing powerhouse for kitchens, bathrooms and practically any other area of the home or office. An extension of Fineline Move is the new Fineline LAVIDOwhich brings all the organizational elegance and innovation to one of Häfele’s most popular products: the LAVIDO Pantry Pull-Out. 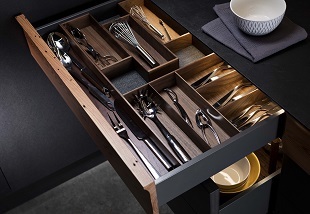 Expanding the options for silverware and other drawer contents are Häfele’s Sky Cutlery Trays. These entirely customizable inserts are available in Slate Gray or Textured White and can be cut-to-fit as well as further segmented by optional dividers which easily snap into place. Moving below, base cabinets are made more functional with the addition of new Wood Roll-Out Traysfeaturing new, even smoother operating slides. For those seeking a more customizable solution the Base Pull-Out 2offers entirely height adjustable storage trays and baskets now available in new finishes including Silver and Champagne on updated, smooth runners. Let’s not forget about culinary byproducts, more commonly called “taking out the trash.” Häfele’s Wood Frame Bottom Mount Waste Binis available in multiple configurations and cabinet sizes for a variety of applications. The Häfele MX Pull-Out Bottom Mount Waste Binfeatures a double wall steel frame and updated runners available in Champagne, Metallic Gray or Metallic White finishes—best of all, it comes fully assembled from the factory. Rounding out new waste bin offerings is the Hailo US Cargo 18which can be used in face frame, inset door or frameless door applications. It’s easy to install and includes a unique cover which helps to mask unsightly odors. Lastly, it’s been tested to 130,000 cycles. With these and many other products, the demanding kitchen user has officially met their match.